Part science and part art, the process of creating high-performance algorithmic multi-effects processing requires both of these technical and creative disciplines operating harmoniously in counterpoint. For more than 40 years, Anthony Agnello has, in his words, "stumbled through this delicate dance" with his work and craftsmanship at his pioneering firm, Eventide Audio. Following his design of the H910 and H949 Harmonizers in the mid-'70s, Anthony set out to make groundbreaking space design effects commercially available for the first time. Developed between 1978–1981, the Eventide Signal Processor Model SP 2016 was pro audio's first programmable effects box—and it introduced the concept of the plugin to the music production and audio engineering communities, with its interchangeable ROM plugin chips. "I started researching reverb in earnest in 1978. Once I realized the kind of processing power and architecture needed to code a convincing simulation of a room, I made the decision to build an array processor that could be programmed to do other effects that I was interested in as well," Agnello says. 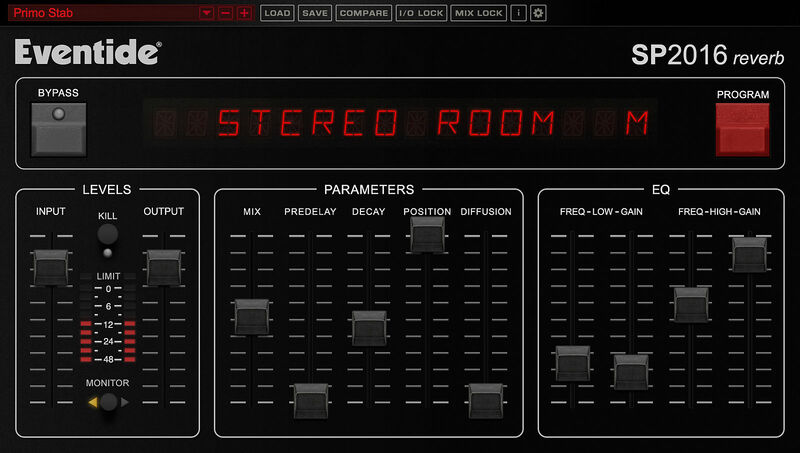 In 2012, Eventide released the 2016 Stereo Room VST/AU plugin—a popular digital version of the original hardware's stereo room reverb setting. But until today, with the release of the SP2016 Reverb plugin, all of the reverb algorithms of Agnello's hardware processor had never been included in a digital format. To celebrate the release, we're looking back at the history of the effects processor and taking a look at all of what's possible with this new plugin. Released in 1982, the SP2016 was a 3U rackmount multi-effects processor that could be customized, programmed, and even had enough memory to save user presets and instantly recall them. The scope of the processing capabilities the SP2016 was constantly expandable—thanks to its pioneering use of ROM chips that provided new effect algorithms. When loaded up, different chips would allow for different functions. 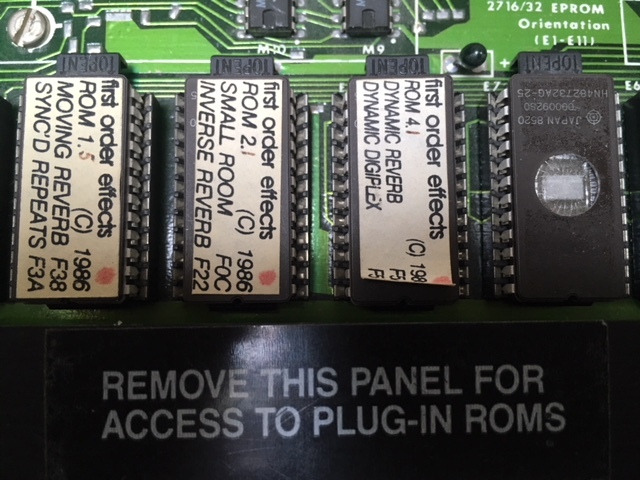 The machine's main buttons, like Execute, Command, and Softkey, would control a certain aspect of one effect's preset, but entirely differently parameters for another, depending on which ROM chip was employed. The SP2016 was capable of a large variety of effects processing: delays, reverbs (reverse, gated, infinite), digital filtering, EQ, gain control, chorusing, flanging, as well as introducing new effects like vocoding, looping, band delays, timescramble, and various forms of synthesis. It also offered signal analysis and self-diagnostic testing. Eventide's "History of Eventide SP2016 Effects Processor/Reverb"
"People had trouble understanding what it was and what it could do. Digital reverbs like the EMT, Lexicon, and Sony, were very popular products, and we confused a lot of people who just wanted a great reverb. We would have been better off if we had limited the box to just reverb," Agnello says. Algorithmically modular by design, the on-going development of these ever-expanding ROM chips—featuring even more refined algorithms—resulted in a suite of effects that introduced such iconic reverb programs as "Room Reverb," "Hi Density Plate," and "Stereo Room." Original SP2016 (1982) "Plug-In ROMs"
Revered for its signature rich lushness, the SP2016 can be heard on many iconic records from Talking Heads and Madonna to Mariah Carey, Eminem, and more. Predominantly used by notable engineers and producers, such as Dave Pensado, George Massenburg, Alan Sides, Roy Hendrickson, Jack Douglas, and Mick Guzauski, the SP2016 has been a secret guest star on countless hits since its release in the early 1980s. "The SP2016 had, I'd argue, more convincing reverbs and a wider range of reverbs than most any other product available, but the box confused the hell out of people. For instance, it had a button labeled Softkey and, at trade shows, people would ask me what it did and I'd say, 'It depends on the algorithm,' and they'd glaze over," Agnello says. With the initial design conception and on-going ROM chip modularity improvements, Eventide opened up the ability for anyone who wanted to develop algorithms for the SP2016, offering a complete development system—an open-source schematic—featuring software defined controls such as switches, buttons, and of course, the Softkey control. The additional features of MIDI integration and remote control made the SP2016 the most cutting-edge effects processor of its era. But soon, those technological advancements gave way to another. "By the mid-'80s, chip vendors like TI introduced DSP chips, capable of processing full bandwidth audio, rendering the array processor technology at the heart of the SP2016 obsolete," Agnello says. The next incarnation of the original SP2016 arrived in the form of the Eventide Reverb 2016 by Princeton Digital—a company founded in 2002 by Anthony. The Princeton Digital unit naturally simulates every aspect of the sound of a real enclosure, including the smooth Gaussian decay of the reverb tail. Agnello formed Princeton Digital to apply the recent advances in DSP technology to the reproduction of high-quality, modern versions of some of those earlier Eventide effects. The Reverb 2016 featured more complex early reflections, higher density, and extensive, precise parametric controls, such as 24-bit fixed point digital signal processing, 24-bit analog I/O, digital I/O, and a MIDI interface. Built specifically for reverb and not multi-effects processing, the Princeton Digital reverb unit represented the evolution in DSP technological developments—including a drastically increased bandwidth—allowing the processing of previously impossible computations before, within the limitations of the SP2016's array technology. 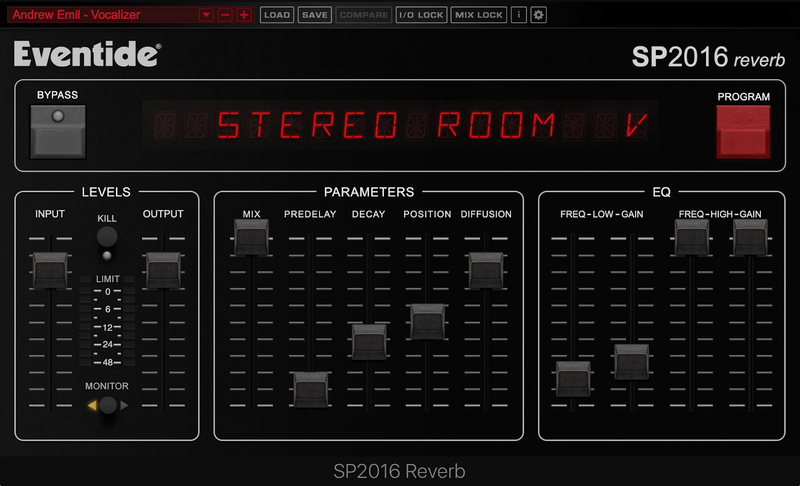 Originally released as a TDM version in 2008, the Stereo Room plugin was Eventide's first step towards a software version of the original SP2016. It featured Stereo Room, Room, and Plate algorithms from the original unit. In 2012, they ported this TDM version to run as a VST/AU formated plugin, capturing a larger audience with the Eventide 2016 Stereo Room Reverb. This simple yet effective reverb processor was crafted to simulate a great sounding "room." Focusing on just this one famous reverb algorithm from the original SP2016, the 2016 Stereo Room was distinctive with its complex early reflections, smooth decay tail, and EQ block, as well as the character-altering diffusion and decay controls. For the the first time ever, this classic reverb algorithm was made available in a processor format that could allow multiple instances running simultaneously. Piquing the interest of old school fans of the original SP2016 unit room sound, this intuitive plugin got the preset treatment from Joe Chiccarelli, George Massenburg, and Dave Pensado—with all of them crafting settings that range from subtle spaces to the characteristic lush room sounds and everything in between. Fast forward to today, Eventide Audio has finally released the long awaited plugin version of the world's first plugin with the Eventide SP2016 Reverb. Building upon the the old and the new, the Eventide SP2016 Reverb plugin features all of the lush and natural-sounding elements found within both iterations of this quintessential multi-effects processor, and more. Combining the previous sonic familiarities and spatial distinctions, this new addition to the Eventide product line features even more functionality than ever, including the ability to run many instances at once on the same channel—as is implicit with music software plugins—or multiple processing busses in tandem. This reverb plugin offers their full spectrum of classic lush reverbs, delays, and multi-effects for a fraction of the cost of the hardware, opening up this sound design tool to an entirely new generation of pro audio enthusiasts. "The Princeton Digital box, TDM release, as well as the 2016 Stereo Room were based on my initial attempts at emulating the original SP2016 box. The algorithms are fairly exact, but I did screw up some minor stuff, including— funnily enough—the sample rate," Agnello says. "My memory was that the original sample rate was exactly 40kHz. Turns out it's close, but not exact. I never bothered to measure the box." "That, plus a few other errors/bugs resulted in the Princeton Digital stuff sounding really good, but not exactly like the hardware. Eventide's DSP guys decided to dig in and 'make it right,' the Eventide SP2016 Reverb Plugin is the great-sounding result of that," Agnello says. "The Princeton Digital box, TDM release, as well as the 2016 Stereo Room were based on my initial attempts at emulating the original SP2016 box. Eventide's DSP guys decided to dig in and 'make it right,' the Eventide SP2016 Reverb Plugin is the great-sounding result of that." It ships with a large offering of presets, with many designed by the legendary engineers and producers who originally made such creative use of the hardware unit, including Joe Chiccarelli, George Massenburg, and Dave Pensado. As a new Eventide Artist, this reverb plugin is the first production release software I was asked to contribute preset designs to. Included among this esteemed collective of audio professionals, it was an honor to contribute presets for this this historic product release. The presets I made for this processor cover a variety of use cases—from almost every instrument and sound that you would find wanting space around—including a variety of options for vintage and modern spatial aesthetics. To celebrate the product launch, users can take 70% off the Eventide SP2016 Reverb plugin on Reverb, now through October 31. Registered owners of Anthology XI or the 2016 Stereo Room are qualified for a special upgrade offer of just $29 USD, also until October 31. These 30 presets were designed in the process of producing an upcoming release, "Languid Lament," for a project being released next year on Minneapolis imprint, Abstrakt Xpressions. Check out the audio demos of project to hear my presets in action.